Yellow bellied sliders are omnivorous, eating aquatic plants, fish, insects and carrion, although adult females are largely herbivorous and young and adult males are more carnivorous. 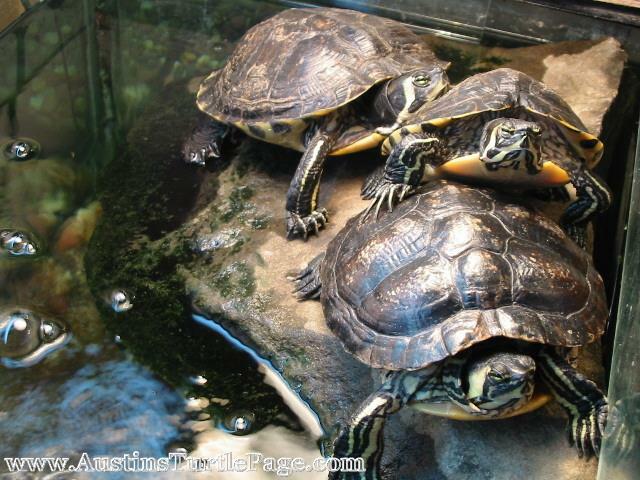 These turtles thrive in a variety of freshwater habitats including lakes, ponds, streams and rivers. use an aquarium no smaller than 15 gallons for HATCHLINGS. 1 adult YBS should be kept in a 60gallon aquarium and up. Add an additional 20 gallons per turtle. Use a good filtration system, preferably an external canister filter. These turtles like to bask, so provide a fair sized basking spot. I would also recommend a submersible heater with the temperature adjusted to 75 to 80 degrees. Recommended size for a single adult Yellow Bellied slider - 60 Gallons. For a Trio, definently 150gallons and up. In captivity, you can use small feeder fish as well as commercially bred insects such as meal worms, wax worms and crickets as treats. Commercial turtle food and chopped vegetables round out a nutritionally complete diet along with the treats. Red Eared Sliders, Cooters, maps, and painted turtles work well together. Most are very sociable and those that are shy tend to lose that shyness rather quickly.